Below are three attachments, each containing articles about the Ford Motor Company's racing activites in 1909. The first is from the June 27, 1909 Indianapolis Star, the second from a day earlier in the Indianapolis News and then another from the News from June 24, 1909 which provided one of the first reports on the race where, at the time, everyone believed the Ford team had prevailed. The Indianapolis Star article announces Henry Ford's return to racing after announcing in October 1907 that he was leaving the sport as he could not justify the risk to his drivers. That announcement came after his driver Frank Kulick was seriously injured when his Ford racer crashed through a fence at the Detroit fairgrounds track. Ford had announced that they intended to compete in the June 18 - 19, 1909 Cobe and Indiana Trophy weekend but ended up withdrawing. This article does say that Henry Ford attended the race. "I feel I will have to enter the racing game again. I thought I was through with it a couple of years ago, when Frank Kulick, driving the big racer that I designed for him, crashed through the fence at the fairgrounds track at Detroit...This accident almost proved fatal to Kulick; in fact it has left him with a noticeable limp and he was laid up for almost a year after it happened." Continuing on Ford indicates that the new Indianapolis Motor Speedway that was under construction at the time was a big factor in his decision to return. This combined with Kulick's persistent requests to return swayed Ford. 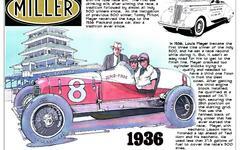 "But the Indianapolis Motor Speedway has opened the closed book to the advanced pages of the story. Since the track has been under way Kulick begged me many times to let him have one more trial at the big six racer which I have always considered as the fastest car in the world." Ford described the new car as very light - less than 1,500 pounds - with a six-cylinder engine and six by six bore and stroke developing 150 HP. Interesting comparisions are made to Ford's original purpose-built race car, the "999" that Barney Oldfield drove into the record books. From this article it is apparent how important the car was to building the Ford brand - especially after Oldfield defeated Alexander Winton using the "999" in 1902. The Indianapolis News article reports on a protest filed by the Shawmut Auto Company against the Ford Motor Company disputing the results of the "M. Robert Guggenheim trophy cup" and the $2,000 prize that came with it. This was a coast-to-coast race organized by the Automobile Club of America (ACA) and Ford. At Ft. Steele, Wyoming a wagon bridge had been washed out. When the two Ford entries encountered it, they were allowed to cross on a railroad bridge but the Shawmut entry was not. The Ford entry carrying the #2 was accused of breaking driving rules. At Snoqualmie Pass a Ford employee of their Seattle location, a man other than the designated driver of the car, drove the machine. Once through the pass the original driver returned to the wheel. The same car arrived at the finish line in Seattle with a new axle in the car. This apparent replacement of the axle was against the rules. Months later the Ford cars were disqualified. The June 24, 1909 Indianapolis News article covers the race as it stood prior to the protest. The important point is that apparently Henry Ford had committed to Indianapolis Motor Speedway Contest Director Ernie Moross that he would field a new six-cylinder entry in the Speedway's inaugural auto race meet the following August contingent on a Ford winning the Seattle endurance go. It's worth noting that Ford never did enter that competition and that it is possible the protest had something to do with it. However, Ford did not enter the first Indianapolis 500 in 1911 and did not invest in purpose-built race cars during these early days. The article is actually a digest that also reports on other developments such as a new car designed for taxi cab service by J. Walter Christie. This product made use of Christie's innovative front wheel drive design. Chrsitie is noted as an innovator also credited with developing the revolving turret for warships and an efficient "packing" for large diameter steam pistons. Another item notes that the American Automobile Association reported that a record shipment of 19 automobiles were transported on a French freight steamer to Europe.